First of all…. I would like to wish everyone at Your Next Stamp a Happy 6th Birthday! I have only been following this amazing company for a few months…but already I am totally in love with them! Secondly, the August release is soooo good!…if you haven’y already done so…check out the Birthday Blog Hop and be sure to leave a comment on all of the blogs for your chance to win a $50.00 YNS gift certificate. WOW! Not only this, but if you buy something from the store before the 31 August 2015 then you can use the discount codes available, and save yourself some money!And if that was not enough! !…If you spend over $40 YNS will send you a free Birthday stamp set!!! Sooooo generous!…it would be rude not to! LOL! I started off by stamping the image ‘Quackers the Duck’ (#FB077) in Momento Tuxedo Black ink and coloured him with Spectrum Noir Markers. Then I fussy cut him out and popped him up on foam tape to give extra dimension. I stamped the sentiment with Versamark ink and heat embossed it with WOW! Opaque Bright White Super Fine Embossing powder. Lastly, I attached three Green Apple Glittered Gumdrops and used a Wink of Stella Clear glitter pen and Glossy Accents to his eyes, bill and feet. I am so happy that you have enjoyed the August release. I am also very excited that you are playing along with our current challenge. Your card is super cute. You rocked the sketch. 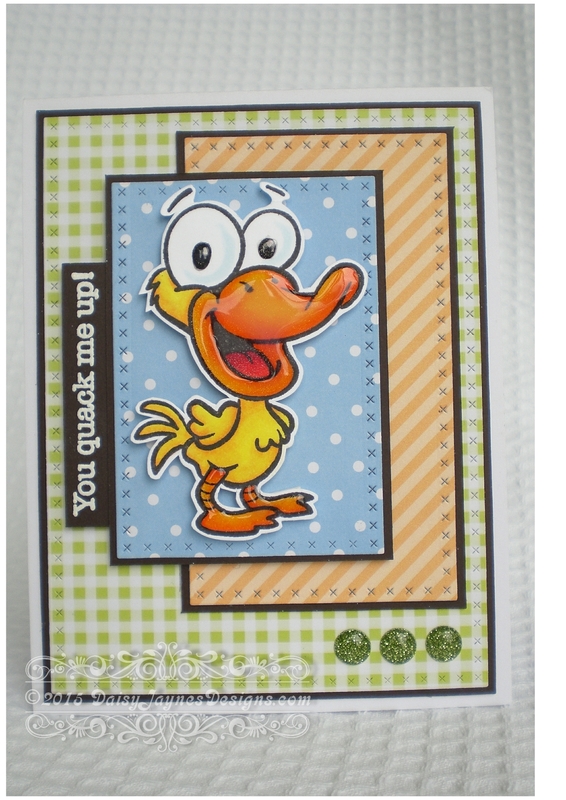 Quackers is just the cutest and I love the Glossy Accents you added. Thanks for playing along with our challenge at Your Next Stamp. Love this!!! That glossy accents on his bill is perfect and the coloring is so bright and fun.. So glad you are playing along with us.. Thanks for joining us at Your Next Stamp.